Protein homeostasis, or proteostasis, is the process of maintaining the conformational and functional integrity of the proteome. 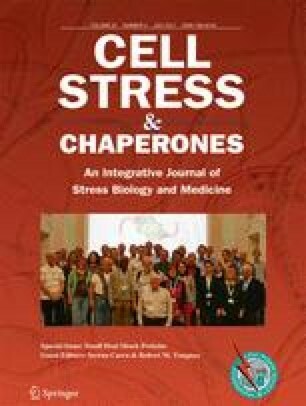 Proteostasis is preserved in the face of stress by a complex network of cellular machinery, including the small heat shock molecular chaperone proteins (sHsps), which act to inhibit the aggregation and deposition of misfolded protein intermediates. Despite this, the pathogenesis of several neurodegenerative diseases has been inextricably linked with the amyloid fibrillar aggregation and deposition of α-synuclein (α-syn). The sHsps are potent inhibitors of α-syn aggregation in vitro. However, the limited availability of a robust, cell-based model of α-syn aggregation has, thus far, restricted evaluation of sHsp efficacy in the cellular context. As such, this work sought to establish a robust model of intracellular α-syn aggregation using Neuro-2a cells. Aggregation of α-syn was found to be sensitive to inhibition of autophagy and the proteasome, resulting in a significant increase in the proportion of cells containing α-syn inclusions. This model was then used to evaluate the capacity of the sHsps, αB-c and Hsp27, to prevent α-syn aggregation in cells. To do so, we used bicistronic expression plasmids to express the sHsps. Unlike traditional fluorescent fusion constructs, these bicistronic expression plasmids enable only individual transfected cells expressing the sHsps (via expression of the fluorescent reporter) to be analysed, but without the need to tag the sHsp, which can affect its oligomeric structure and chaperone activity. Overexpression of both αB-c and Hsp27 significantly reduced the intracellular aggregation of α-syn. Thus, these findings suggest that overexpressing or boosting the activity of sHsps may be a way of preventing amyloid fibrillar aggregation of α-syn in the context of neurodegenerative disease. The online version of this article (doi: 10.1007/s12192-017-0785-x) contains supplementary material, which is available to authorized users. DC is supported by an Australian Postgraduate Award. HE was supported by an Australian Research Council Future Fellowship (FT110100586). This work was supported by grants from the Australian Department of Health and Ageing and the University of Wollongong. We thank Dr. Tracey Berg (University of Wollongong, Australia) for help in developing the bicistronic constructs used in this work and the Illawarra Health and Medical Research Institute for technical support.